Crosswhatfields has received an email from both the local Neighbourhood Link Metropolitan Police and the council's Local Assembly Team about a Crime Survey launched last week. The aim is to assess and understand the crime and antisocial behaviour issues affecting Lewisham's residents and visitors. The results of the survey "will help to set the annual priorities of the Safer Lewisham Partnership (SLP) for 2012-2013. The questions will also guide Lewisham Council, the Metropolitan Police and the other partners when focusing activity and funding to tackle these priority areas over the next year." The Council would like as many people as possible who live, work, visit or study in Lewisham to complete the survey, and hope that you will give them a few minutes of your time to let them have your views on crime and anti-social behaviour in Lewisham. A report with the results of the survey will be available on the Councils website. All responses are confidential and anonymous, and any comments you make will not be identifiable, although there is an optional request for your postcode. You can also supply your email address if you wish to be kept updated. The survey closes on Wednesday 22 February 2012. In the recent consultations on the proposal for a Creekside Conservation Area, it became apparent that residents of Frankham House were most concerned at having been left out of the zone (see the map and find the reports here). Several attended the event at Creekside Discovery Centre on 7 January, resulting in Frankham Housers being sent the questionnaire which everyone else has received so that they can argue for their inclusion. Other areas suggested for inclusion are the Nature Park and land extending north to the borough's boundary along the Creek, plus west to include the old Tidemill School (a fine building that deserves preservation). The consultation closes next Friday 27th January, so if you haven't responded yet, go to the online questionnaire and fill it in! If you missed the consultation and want to find out more, Phil Ashcroft, head of Lewisham's Conservation Team, has been invited to Crossfields TRA meeting this coming Thursday 26th January to explain – arrive for a prompt start at 7.30pm as this subject will be first on the agenda. When exploring the area, the Conservation Team took into account not only the buildings and architecture, but the "radical arts and music scene that gained Deptford an almost legendary status in the 1970s and 80s". The 'character appraisal' compiled by the team concludes that "Crossfield Estate gains a place within the history of British punk and rock music culture that raises its significance to a national level". The issue of Frankham House being initially excluded has brought to the fore some interesting cultural history pertaining to the block itself. Apart from the fact that Crossfields Tenants & Residents Association has for a long time been housed in the Pink Palace on the corner, another important cultural factor has come into play: that of gender identity. The Lewisham scheme to house single people in hard-to-let flats was known locally as DFRS – the "dykes and faggots residents scheme". This must have been the unofficial title! It was rumoured that there was a very helpful Housing Officer at the time who would look favourably on applications from lesbian and gays. The scheme led to there being a community of lesbians that were known as the Deptford Dykes and if I remember correctly this was a very radical feminist group. They had the Fountain and the Dover Castle pubs on Deptford Broadway as their social spaces. When I lived in Frankham House in 1990, I knew of at least ten flats that were still lived in by lesbians and gays creating a strong sense of community identity which was very important as this was the time of the heart of the Aids crisis. At the time, the lesbian community was very strongly feminist and men were not permitted in some of the women's flats, which led to officially sponsored training schemes in plumbing and other building trades so that women could carry out the works needed. When Sarah Daniel's play about the women workers in Deptford's Foreign Cattle Market was performed in the Albany in 1988 ("Gut Girls"), the lesbian community found their very own historic links to Deptford. In the 1980s and early 90s the gay community faced an onslaught by the Thatcher government through Section 28. Gay urban identity was very political. Along with our Enemy Within badges left over from the Miners' Strike, we wore pink triangles, read the Pink Paper (available at the Albany along with Capital Gay), and met in the Pink Palace. Whether lesbian or gay, we wore Levis 501's, Doc Marten shoes, MA1 air force jackets and lived in gritty council blocks such as Frankham House. There was a strange correspondence between us as marginal people and the buildings, one of found values and mutual recognition, nobody wanted the flats and nobody wanted gay people. It was love at first sight. At that time the Albany ran a very successful gay night called OutDance where we danced in safe spaces to Jimmy Sommerville/The Communards' You are my World. One of Jimmy Sommerville's videos showed him getting off the East London Line at Surrey Docks – we all knew he was heading for the Pepys Estate, another haven for gay people where the high rise views over the city afforded their own sense of freedom. The 1993 play by Jonathan Harvey, Beautiful Thing, filmed later in 1996 on the Kidbrooke Ferrier Estate (another infamous South London council estate) and in the gay pubs in Greenwich, further validated and consolidated the sense of the urban gay community in South London. There was only one gay cafe in London at the time, First Out, which was not a pub. Father Diamond at St Paul's Church Deptford also ran a gay night in the Crypt, and although not openly gay himself was very supportive, especially of the older working class gay community in Deptford. Deptford was very gay in the late 80s and through the 90s and the centre was Crossfield Estate, mostly concentrated on Frankham House. An early gay play on BBC Radio 3 or 4 about a gay pub in Rotherhithe, The Only One South of the River, and the club night Tattooed Lover Boy in Brixton further bolstered Deptford's gay scene – meaning that South Londoners forged their own identity with 'high' and 'low' culture apart from the more commercial West End. These South London venues were possible because of the concentration of lesbian and gays in places such as Crossfields and Pepys Estate. Getting home was easier and hopefully safer. A new, younger, and less political generation of gay people arrived in the mid 1990s. Though he had less commercial success that other Deptford bands, James Gray, who arrived at number 13 Frankham House when he was 18, wrote and performed his own songs, sometimes inspired by the area – such as Glamourland and White Malaise, and Boom Cover Trade based on Deptford's seafaring past. Crossfield Estate was and remains an important factor in the forging of an urban gay identity in London, in South London and in Deptford and Frankham House in particular. Crosswhatfields has dug out some images that, in addition to Chris's piece, may jog people's memories of these times in Deptford. Please feel free to add your own recollections in our comments section – especially if they include time spent on Crossfields, and in particular, Frankham House! 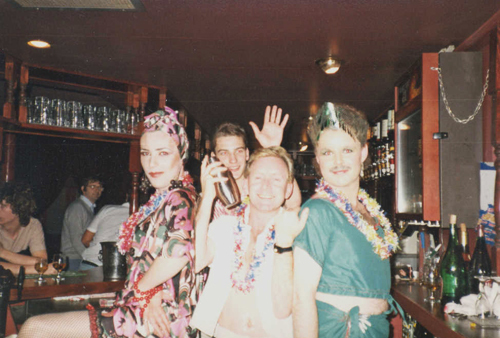 Above, a photo we found at www.Stradivarius-London.co.uk, posted by Paul, who DJ'd at The Dover Castle, featuring staff Jason, Owen and Terry behind the bar at a Caribbean night in August 1985 (more pics at that website). 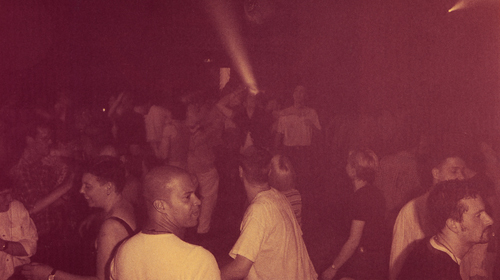 A night at If..., the late night lesbian and gay club at the Albany in the late 90s, which continued the tradition begun by Outdance in the 80s. Below, some memorabilia showing the range of lesbian and gay nights programmed by The Albany in 1987 and in 1997. Greenwich Council is holding a weekend of events to celebrate becoming a Royal Borough, kicking off on Friday 3rd February in Woolwich, in Eltham on Saturday 4th Feb, and a finale in Greenwich on Sunday 5th. On the Sunday there will be free entertainment and children's art workshops in and around Greenwich Market and the Maritime Museum from 10am – 5.30pm, and the document confirming the borough's royal status will be on show at the Discover Greenwich visitor centre. From 2-6pm there'll be live music on Pepys Lawn in front of the Old Royal Naval College, and the day culminates in a costumed parade with local schools and community groups walking from College Approach arriving at Pepys Lawn just before six, when there'll be a "stunning music and fireworks" finale on the lawn, ending at 6.15pm. Thanks to Ian Visits for the tip-off. See the Greenwich Council website. We regret to inform you that the Betfred saga is far from over. Having been turned down a second time by Lewisham Planning, they are now appealing again to the Government Planning Inspectorate in Bristol. 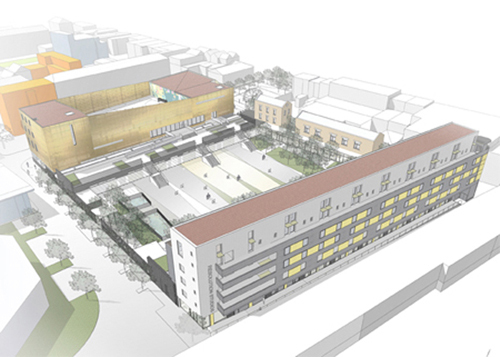 Comments previously submitted to the Council as objections have been forwarded to the Planning Inspectorate and will automatically be considered by the Inspector. Any further observations you wish to make should be emailed by 17 February 2012 to: teamp6@pins.gsi.gov.uk. Address your email to Ms Vicky Williams, and quote reference APP/C5690/A/11/2168006/NWF. The usual jolly scene outside Ladbrokes and Paddy Power today. Here's the Deptford Betting Map – updated since Better at no.14 became Jennings very recently. (Hales Gallery at no.70 was originally bought by Jennings who quickly sold out to Coral). Also see 853's post about Coral taking over the Nationwide in Lewisham High Street. 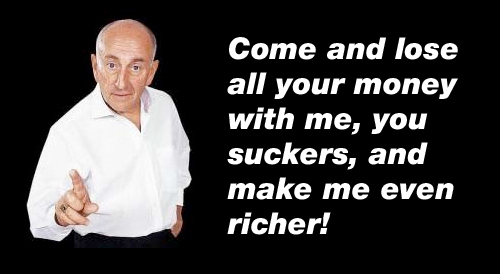 If you're unfamiliar with the history of Betfred's attempts to grab a share of the profits being made by their rivals already operating on Deptford High Street, you can read all our posts about last year's campaign against them here. Alternatively, for a brief summary, pop over to the Deptford Dame. In December 2011 we contacted Lewisham Arts Service to ask for their assistance in the potential restoration of the Love Over Gold mural on Creekside. Cockpit Arts inherited the mural (originally painted in 1989) when they bought the building but had had to replace the rotting wooden doors which contained the centrepiece of the mural in October 2011 (see previous post). Brigid Howarth (Lewisham's Creative Industries Officer) responded with the suggestion of a meeting in the new year, and last week she met with artist Gary Drostle, Becky Kingham (Cockpit Arts studio manager) and Sue Lawes (representing Crossfields) at Lewisham's Civic Suite. As the artist originally commissioned to paint the mural, Gary Drostle had asked specialist paint manufacturers, Keim, to survey it and estimate the cost of its full restoration (Keim's paints were used in the original). They came back with a figure of £10.5K – a lot of money to find! Gary advised that splitting the work needing to be done into smaller segments over a period of time – as funds became available – would ultimately cost much more, but he estimated that the cost of simply reinstating the centrepiece of the mural on the new steel doors would be around £1000, since the same expensive paints would not be required for this. Brigid explained that funds available to her to spend on public art were a miniscule £2000, but that the landmark mural was one that the borough was very proud of, and she was prepared to commit £500 seed money to help get renovation started. Becky Kingham kindly offered to match this amount with a further £500 from Cockpit Arts. It was decided that Gary be commissioned to put back the missing part of the mural on the new doors. Another £9.5K needs to be found through voluntary fundraising efforts on the part of Crossfields and Cockpit Arts over the next 12 months, with initial help from Brigid to put together a funding package. At a time of continued budget cuts in the most needy areas, mural restoration may come bottom of the list, but we hope that there is enough community support to back up any approaches made to those organisations (such as local developers) who may have the spare cash to commit to such a project. 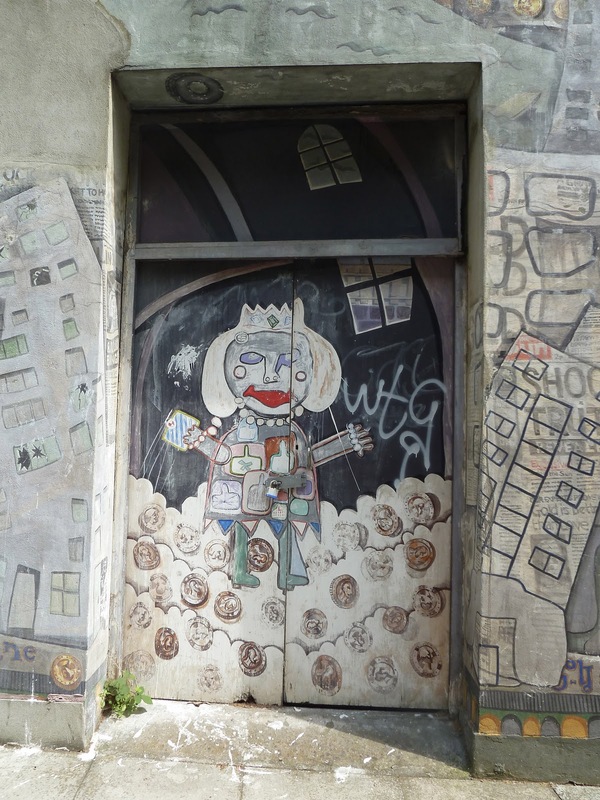 The London Mural Preservation Society has also contributed some helpful ideas for fundraising which we hope to follow up in the coming months. Work will not start on the doors until the Spring, but once restored, the meaning of the Love Over Gold mural will again be apparent. 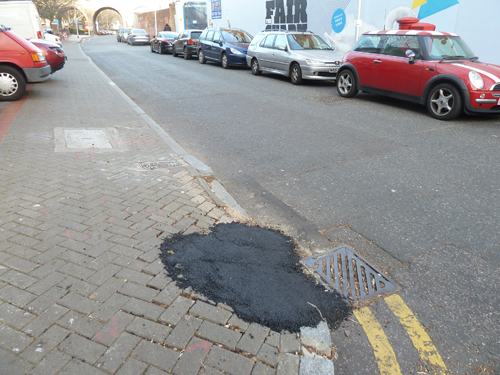 In October 2011, Laing O'Rourke dug up the pavement outside Holden House (east) on Creekside on behalf of Southern Electricity. 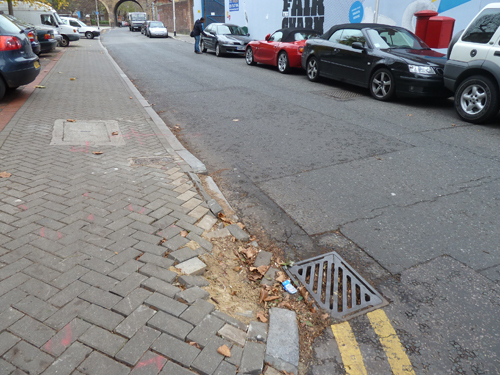 In November 2011, the area where they had reinstated the pavement had collapsed around a drain. 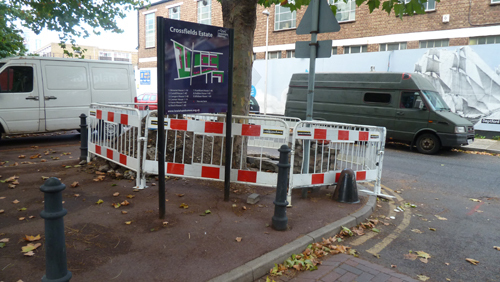 We posted a photograph on Love Lewisham, referring to the contractor's handiwork, and suggesting there might be some collapsed pipe work beneath that may need attention. We wonder if it would have been done any better had Creekside already been designated a Conservation Zone. Somehow, we doubt it. Just before Christmas, on 21st December 2011, long-time Crossfields and Browne House resident Patricia Hardwicke passed away peacefully at the ripe old age of 80. Pat had been battling cancer but until recently was still assisting the Tenants & Residents Association in her role as Treasurer. Pat's funeral will be held on Wednesday 11th January 2012 at 10am at Honor Oak Crematorium, Brenchley Gardens SE23 3RD. The hearse will leave at 9am from 2 Greenstreet Hill (opposite Drakefell Road) SE14 5SR. Floral tributes are welcome – these can be sent or ordered from Francis Chappel Funeral Directors, 4 Lee High Road SE13 5LQ (020 8852 2936). Born on 9th January 1931 in Birmingham, Pat had an adventurous life. Having left home at 18 to study art in Paris in the 50s, she ended up from the late 50s to 70s working for UNESCO in Paris and Geneva, then for UNDP in Ethiopia, the Congo and Sierra Leone during which time she visited many other countries in Africa. Many nations where she lived were enduring volatile political situations, though this never seemed to worry her. In the late 70s she enrolled at London’s Goldsmith University College and fulfilled one of her lifelong ambitions of earning a degree, which she took in Sociology. This is the time when she first settled in her flat on Crossfields Estate, Deptford, which she was to keep for the rest of her life. 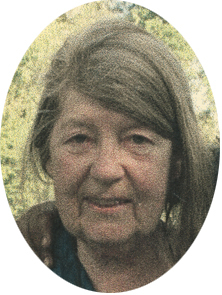 She then re-trained as an English teacher, but, forever adventurous, Pat was often away teaching at schools in Africa, the Middle East and South America. In the 90s, she settled back in London on Crossfields Estate, during which time she worked as a volunteer support teacher at Tidemill Primary School, and also for many years Pat was the treasurer for the Crossfields Tenants Association. One of her greatest pleasures and passions throughout her later life was the support she gave to local children through private tutoring, to help them prepare for their exams. Pat will be fondly remembered as fiercely independent, always ready to help, and a reliable friend. Pat is survived by her sister Chris and her family, her son Alain, his wife and her grandchildren Yeelen and Dounia. Find out how the proposal to make Creekside a Conservation Area will affect you. Ask why Frankham House is not included or why the area does not extend further north. Make your views known by Friday 27 January. For more info see our previous post. Also see here for details about the redevelopment of Faircharm Estate which will be seriously curtailed by the Conservation Area proposal. The Deptford Lounge opened its doors to the public today and Tidemill Primary school began a new term in brand new facilities. The excited screams of the children could be heard two streets away as they explored their fantastic new playground, whilst students of further education settled down to study quietly in the new library. The two computer suites (including Apples Macs) were also almost fully occupied and coffee and snacks were being served from a kiosk in the main area. 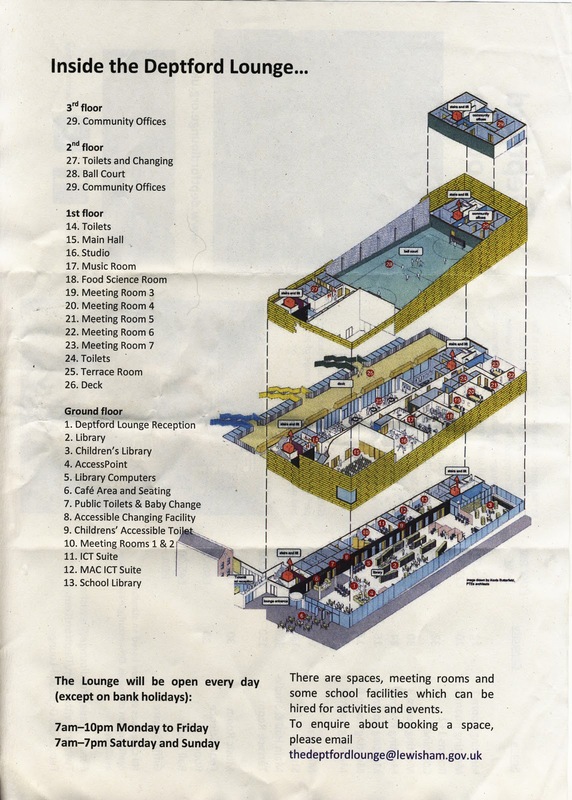 The children's library area is substantial (we wonder how noise will be kept to a minimum when that is fully utilised since it does not appear to be screened off). Public access to much of the building is restricted. 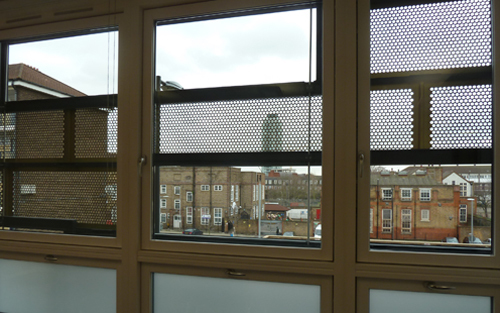 We joined founding members of the New Cross People's Library on a tour upstairs with Lounge staff, where we saw spacious meeting rooms and got a glimpse of the top floor open air ballcourt. We were unable to see the new hall (with its large picture window opening out onto Giffin Square) and the studio space on the first floor since these areas are to be used by the school until 4.30pm every weekday. A view of the old Tidemill School from one of the meeting rooms. With the prison-like outer-casing of the building blocking some daylight, the room was illuminated by sensor operated indoor lighting. 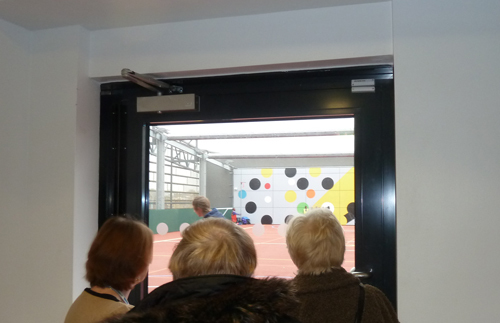 A Lounge staff member shows ex-Crossfields residents and founding members of New Cross People's Library, Kath Dunbar and Jill Hart, a quick view of the ballcourt on the top floor. The hall, studio space and meeting rooms are for hire at times when the school is not using them, as are the ballcourt, a jamming suite, a food technology suite, and a dining hall and kitchen (that lead out onto a generous roof terrace). Meeting room hire fees start from £18 an hour, whilst the main hall has a capacity of 190 people and costs £60 per hour. 320 people can be accommodated in the hall and studio combined at a fee of £100. 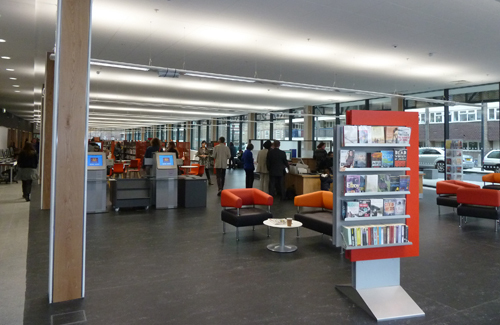 Other hire fees can be obtained by emailing thedeptfordlounge@lewisham.gov.uk or pick up a leaflet at the library. The school, we are assured, is being charged a "fair rent" for its use of this brand new community facility, now that it is an Academy. The kitchen appeared to be not up and running today however – we spied the children being served sandwiches and fruit. 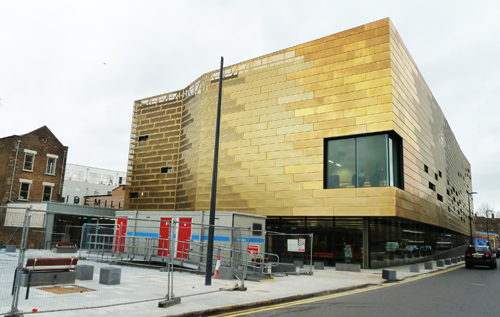 The Deptford Lounge is expected to be officially opened in February by which time it is hoped that the new Giffin Square will be completed (along with a levelling of the tarmac on the road that surrounds it). Meanwhile, the Lounge will now be open every day except bank holidays from 7am-10pm Monday to Friday and 7am-7pm on Saturdays & Sundays. 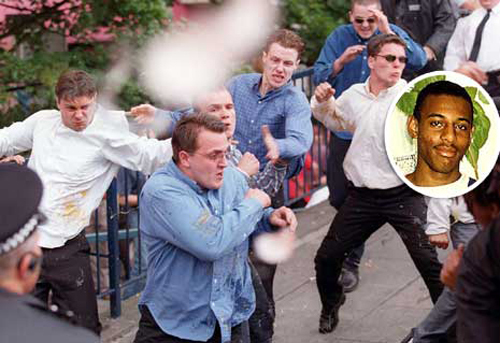 The Lawrence Five were pelted with eggs when they appeared at the McPherson Inquiry in 1998. Eighteen years after David Norris, Gary Dobson, Neil and Jamie Acourt and Luke Knight murdered Stephen Lawrence in a street in Eltham, justice has finally been partly served with 'life' sentences for Norris and Dobson. The Acourt brothers and Knight are still walking about free men. The McPherson report also detailed the evidence against the five suspects that had led the police to the gang in the early stages of the investigation, including secret surveillance (see The Telegraph). However, none of that evidence has been used in this case which has rested on highly contested forensic evidence. Dobson and Norris could only be brought to trial since the scrapping of the double jeopardy legal principle in 2005. 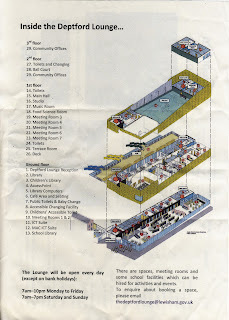 Darryl over at 853blog has written a thoughtful piece about growing up in Eltham – he was in the year above Stephen at school – and pays tribute to Doreen and Neville Lawrence.